A few weeks ago, I wrote about my surprise discovery of two large, old rolled-up parchments in my aunt’s basement. 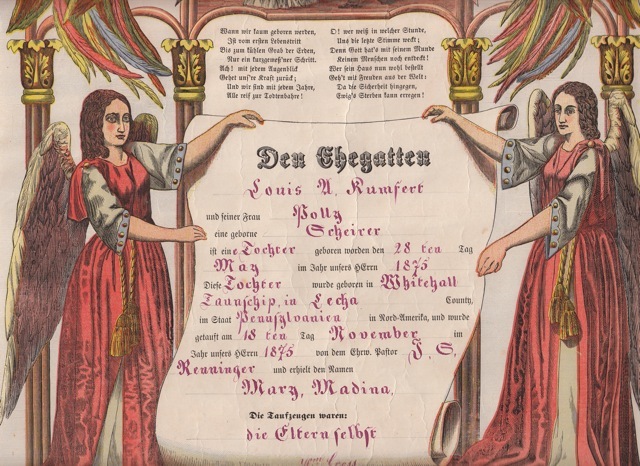 The parchments, beautifully illustrated and written in Gothic German, turned out to be the original baptismal frakturs of my great-grandparents, John Llewellyn Eberhard and Mary Madina Comfort. To me, this discovery of original documents that my aunt didn’t realize she had and couldn’t identify brought home the old adage, “You never know unless you ask.” I think a lot of family historians can relate to finding pieces of their puzzle in places they never expected. the year 1875 by the Pastor J. S.
Just goes to show, like love in Love Actually (one of my favorite movies), treasure is all around us! What an amazing find and treasure, Shelley . . . you just never know! Congrats! Thanks, Gini--it was a thrilling find for me! Thank you for the link, Ycpa. It worked perfectly and I'm glad to have the info on the pastor. I've added the book to my Google ebook library. Really appreciate the tip!